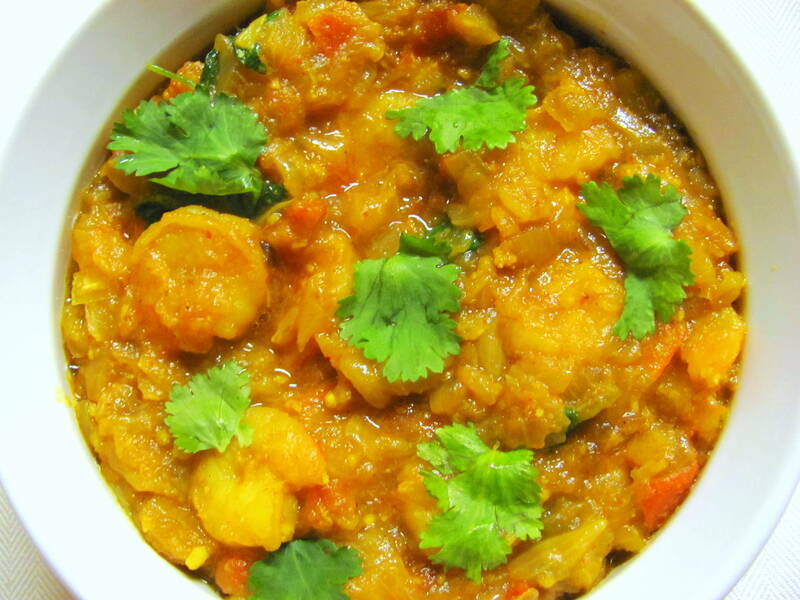 Shrimp Curry | The Flavor Nook! This is my hubby’s special recipe. He loves seafood especially shrimp and loves to cook it too! So, whenever we get shrimp he is the chef in the kitchen! 1. Chip-off the tail of the shrimp and cut each into half if needed. 2. In a wide skillet, heat some oil, then add cumin seeds, cloves, chopped onions and green chillies. Fry them for a few minutes until the onions are translucent/light brown. 3. Once, the onions are done, add turmeric, red chilli powder, coriander powder and salt and fry them for a couple of mins. 4. Add the chopped tomatoes now, and cook until they are tender. 5. Now, add the shrimp and cook for about 12-15 mins. 6. Finally, you can add a hint of lime juice, garnish it with cilantro and enjoy the curry with rice or roti.